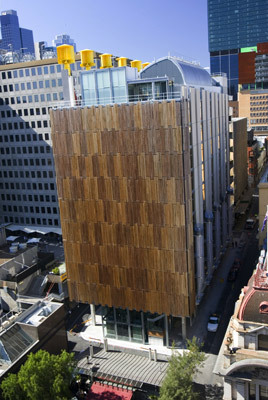 The City of Melbourne's Council House 2 (CH2) project, showcased on the Your Building website, �is the first purpose built office building in Australia to achieve the six Green Star certified rating. �CH2 features sustainable such as a water-mining plant in the basement, phase-change materials for cooling, automatic night-purge windows, wavy concrete ceilings, a façade of louvres (powered by photovoltaic cells) that track the sun. � City of Melbourne. Training courses designed to provide information for industry to develop the business case for sustainable commercial buildings will be run next month �in Melbourne on 21 November, Sydney on 22 November and Brisbane on 26 November. The courses have been developed from content available on the recently launched Your Building web portal for sustainable commercial buildings. This content has been developed into a hands-on half-day training workshop designed to build industry skills and professional development. Supporters of sustainable commercial buildings are often challenged to justify their motivations to their board or executive management, clients, customers and agents. This justification is often sought because of widespread perceptions that sustainable buildings cost more, hold inherent risks due to the innovation involved, and do not add to portfolio value. Due to the infancy of many sustainable commercial buildings, the supporters' case is often weakened by a lack of documented evidence related to the performance of sustainable buildings. � � � � � � � � employ practical sustainability tools, models and concepts. The Developing the Business Case for Sustainable Commercial Buildings workshop is the first of a series of training courses planned to build industry skills and knowledge of sustainable commercial buildings. For more information, or to register your interest for any of the above courses, contact Lyn Pearson, Education Officer, CRC for Construction Innovation: Tel 07 3138 9295 or l.pearson@construction-innovation.info.